Looking for a USED MCD1513? Designed for long hours of unattended operation of heavy die/molds, the MCD1513 HMC combines high-accuracy machining, complete chip removal, multi-plane positioning and flexible functions for a variety of machining jobs. A highly rigid, long-nose spindle enhances machining performance for deep-end milling and heavy-duty cutting. The table indexes at 0.0001-degree resolution and can support loads up to 8 tons. The standard configuration includes absolute position detection in all axes and multiple spiral chip conveyors that efficiently remove large volumes of chips and coolant. The front door and ceiling of the completely enclosed splash guard open fully for easier setups of larger workpieces. Well suited for FF machining and gun drilling. 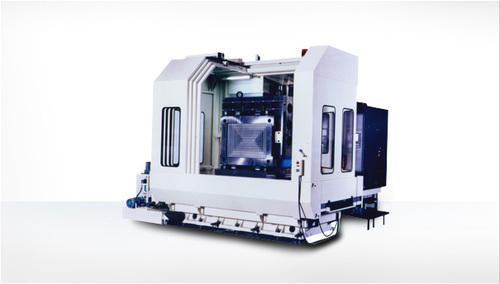 Looking to Purchase a New MAKINO MCD1513?